Hello, welcome to a new (biweekly/weekly/once a month?) series; Middle Grade Monday. Where I will be posting mini reviews of the books I read to my class that I think anyone would like to read. I teach 2nd, 3rd, and 4th grade and one of my favorite parts of the day is reading aloud to them after lunch. I love finding new books to read to them, and occasionally reading a book that I loved reading when I was their age. I get so happy when I’ve picked a good one and they get invested in to the story. Now on to the mini review. 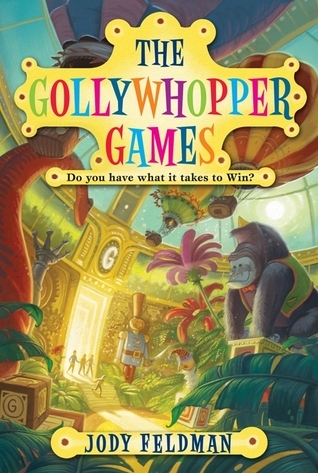 Gil Goodson’s future happiness depends on winning the Golly Toy & Game Company’s ultimate competition. If Gil wins, his dad has promised that the family can move away from all the gossip, false friends, and bad press that have plagued them ever since “The Incident”. Inside the toy company’s fantastic headquarters, Gil will have to master trivia, solve puzzles, and complete physical stunts—and he’ll have to do better than all of the other kids competing. Oh, and did we mention that Gil’s every step—and every mistake—will be broadcast on national television? Hold on tight, because the ride of his life is about to begin! When I first picked this book up I wasn’t sure the kids were going to like it. When I started read it I was afraid it was going to go completely over there heads. (Some of it did but it just made for good discussion.) I thought they wouldn’t get invested. My whole class loved this book. When reading time was over they would beg me to read more. The puzzles the kids had to solve during the game were great, and if I were to read this book again with a new set of kids I would take the time to let them try to figure out the solutions before reading on. The plot was way better than expected, in fact I couldn’t predict some of what happened. Personally, I really enjoyed this book and the fact that my class got so invested in it was amazing. It was really light but exciting. It does have a little bit of a Charlie in the Chocolate Factory vibe to it with the world building and all. The toy factory sounds incredible. Do you ever read middle grade novels? If you don’t, why not?